During WW1, Imperial Japanese troops actively fought against positions of the Central Powers in the Pacific theater. The navy emerged as an almost independent institution and played a minor role within the drama of WWI, but the army saw little action. However, after the Bolshevik Revolution, the Japanese sent 70,000 troops into Siberia, in order to support the White Russians. 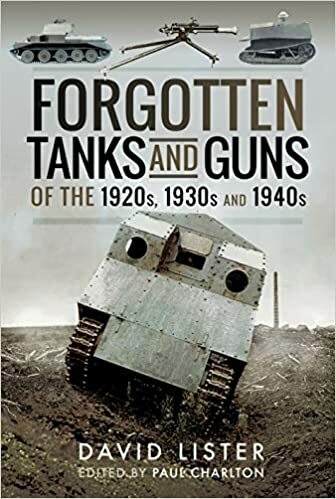 The results and costs of the campaign were not well appreciated back home and, in this context, the need for tanks emerged. Officers found themselves acutely aware of the tank development by the western powers, and the military junta quickly purchased several machines abroad. 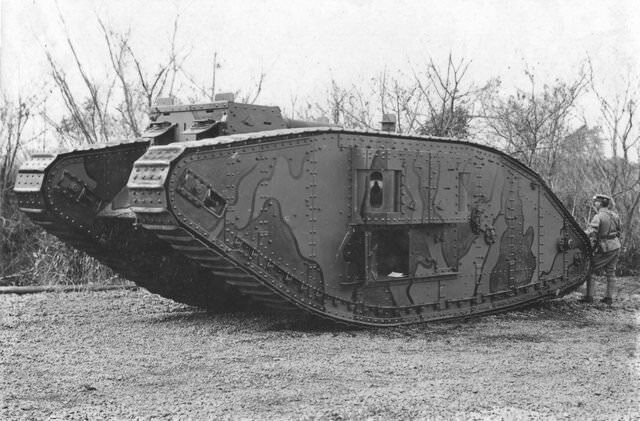 In 1921, the IJA acquired a few British Mark A Whippets, which became the first Japanese tanks, and around 6 machines were duly tested and used in maneuvers until 1930. In 1919, thirteen Renault FTs were bought, the most common tank of the day worldwide, which became the mainstay of the early infantry tank force, under the name of “FT-Ko”. They served during the “Manchurian incident” in 1931, with the 1st Tank Unit of the 12th Division. 10 more vehicles were ordered in 1931 from France, namely the Renault NC27, called “Otsu” by the Japanese, a modernized and improved variant of the FT. They were deployed in the 1st Tank Unit in Kurume, and remained in China for the duration of WW2. The first indigenous design came after the study of contemporary British designs, like the Medium Mark C, at the Chiba Infantry School. These, along with new information about tank tactics, led to the experimental Type 87, in 1927. It was initiated by the 4th Military Laboratory of the Imperial Japanese Army Technical Bureau, and made of soft steel. The Type 89 Yi-Go was built in large numbers, first with the Ko variant, and later the Otsu (278 and 126 units). It was a relatively fast (25 km/h), diesel-equipped, well-armored infantry tank built from 1929 to 1936. It formed the mainstay of the Japanese army in China, participating in the Shanghai incident and subsequent conquest of China. By 1941 they were seen as obsolete, but many participated in the Philippines operations, were they remained until 1944. 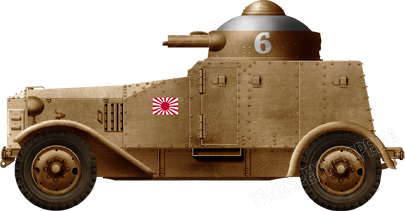 Also in 1927, the Japanese bought 6 Carden-Lloyd Mk.VI tankettes, and copied the suspension system and drivetrain. The first derivative was the “combat car” Type 92 Jyu-Sokosha, built for the cavalry corp. Later on, they built several hundreds of small reconnaissance tankettes, like the Type 94 Te-Ke. By 1933, the IJA had created its first three tanks units, the 1st and 3rd Regiment at Kurume and the 2nd Regiment at the Chiba Tank School. An Independent Mixed Brigade was formed in China the same year, mainly with Type 89 and 94 tanks. In 1934, this was renamed to the 1st Independent Mixed Brigade. 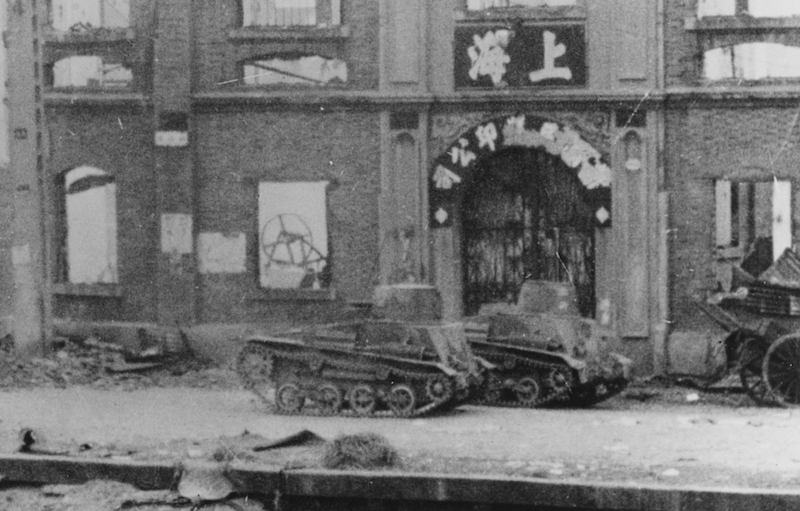 The Chinese had no tanks and few capable antitank guns, so these tanks served as mobile pillboxes and provided infantry support. By 1937, 8 tank regiments had been formed, with a total of 1060 vehicles. By July of the same year, thirteen tankette companies (with four platoons of four tankettes each) were sent to China. The bad roads and general terrain in Manchuria were a proving ground for many tank designs, where engines, suspensions, tracks and transmissions were thoroughly put to the test. In 1938, two (1st and 3rd) Senshadan, or tank groups, were formed to control Manchuria’s borders with USSR. In 1938-39, several frontier incidents had degenerated into a full scale battle. The biggest clash occurred at Kalkhin Gol. IJA forces were defeated by the better tanks and more aggressive Russian tactics. The generals, whom had always seen tanks primarily as a mean to offer support to the infantry, began to see them as a fighting force in themselves. The 3rd and 4th Tank Regiments in Manchuria were equipped with all the range of IJA models in service that year. They were committed during those days, were they lost 42 tanks out of 73, while the Russians had lost 32 BT tanks. After some initial successes, the Japanese tanks were surrounded and decimated. This failure triggered many changes in the IJA tactical thinking and, in response to the Russian tanks, several new antitank guns and new tank models were devised. General Tomoyuki Yamashita was sent to Germany to study Wehrmacht tactics and armored warfare doctrine. He made a report, full of recommendations for new medium tanks and better infantry equipment against tanks. In April 1941, the armored branch became independent, with General Shin Yoshida as first commander in chief. Type 87: The Type 87 was one of Japan’s first standardized armored fighting vehicles. At least a dozen of these Vickers-Crossley armored cars were purchased from England in the late 1920s. They mostly served in the occupation of Shanghai, China in 1932. Type 89 I-Go/Chi-Ro: The Type 89 was Japan’s first production tank. It was inspired heavily by the Vickers Medium Mark C that Japan had purchased from the UK in 1927. 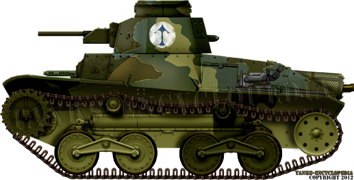 The I-Go was Japan’s first medium tank and saw numerous redesigns over the course of production. Despite being hopelessly outdated, served through the entirety of the Second World War. Type 95 Ha-Go: The Ha-Go was the third tank produced by Japan but it was there first, and only, mass-produced light Tank. It was also the first to use the ‘bell-crank’ suspension The Ha-Go was the last tank of the “Iroha-Go” naming system, and the tank Imperial Japan produced the most of. Around 2,300 of these tanks were built. Despite serving extremely effectively in the early stages of the war in Manchuria and the Pacific (its small size made it perfect for island warfare), the Ha-Go was hopelessly outdated when the United States, with tanks such as the M4 Sherman entered the war. The Ha-Go spawned a few variants over its lifetime. These included the Type 4 Ke-Nu (Ha-Go with an early Chi-Ha turret), Type 3 Ke-Ri (would-be replacement of the Ha-Go), and the Type 5 Ho-Ru (tank destroyer prototype armed with a 47mm gun). The Ha-Go was also one of the only WW2 Japanese tanks to see service in another nation’s Army. They Ha-Go would serve as the Type 83 in the Thai military. Type 97 Chi-Ha & Chi-Ha Kai: The Type 97 Chi-Ha was Japan’s next Medium Tank and became the backbone of Japan’s armored force throughout World War II. The vehicle entered service in 1939-40. Initially, the tanks were armed with a low-velocity Type 97 57mm Tank Gun. While a good infantry support weapon, this low-velocity short-barreled howitzer-like gun was inadequate when it came to dealing with armored target. A need was highlighted for greater anti-armor firepower. The answer to this was the Chi-Ha Shinhoto (“new turret”) also known as the Chi-Ha Kai (“improved”). Simply, this was an upgrade that replaced the standard turret with a larger one, armed with a new Type 1 47 mm gun. Despite greater firepower against vehicles such as the Soviet BT-5 or American M3/5 Stuart, it was still no match for a Sherman unless they closed to suicidally short distance and engaged the M4 from the side. Around 1,162 Chi-Has were built, plus 930 Shinhoto/Kai upgrades. The Chi-Ha served as the base vehicle for many other vehicles, such as the Ho-Ni series of SPGs. 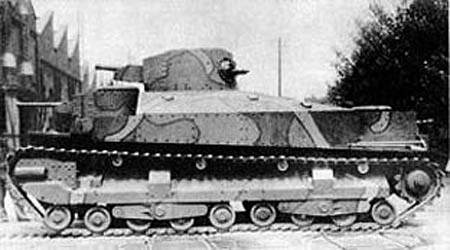 The Chi-Ha’s planned replacement was the Type 1 Chi-He, but only a very small number of these were built and they never saw service. Type 3 Chi-Nu: The Chi-Nu was the last medium tank to see mass production in Imperial Japan, even then, only 144 to 166 were built. It was the first medium tank to be armed with a powerful anti-tank gun. With its Type 3 75mm gun, it would have been more than capable of take on the American M4 Sherman. However, like most of Japan’s better tanks, designed and built late in the war, it never saw combat on the Pacific Islands. This tank, and many others, were held in reserve for the defense of the Japanese home islands in case of an American invasion. This, of course, never came. Type 2 Ka-Mi: The Ka-Mi was one of many amphibious tanks developed by Imperial Japan. The Ka-Mi, however, was the only one to see combat. The tanks in these series all used add-on components to allow them to be amphibious, such as a boat-like bow and stern. Once ashore, the vehicles would shed these components and operate as a conventional tank. The Ka-Mi was extremely useful in the island-hopping campaigns of the Pacific War. The tank entered service in the early 1940s, and roughly 184 were built. Its planned replacements were the Chi-Ha-based Type 3 Ka-Chi, and the Chi-Ri-based Type 5 To-Ku. These tanks would never leave the prototype phase, however. Type 1 Ho-Ni:The Ho-Ni Self-Propelled Gun (SPG) series was based on the Chi-Ha. The one presented here is the first incarnation, armed with a Type 90 76mm Gun, it was one of the few vehicles fielded by the Imperial Japanese Army (IJA) that could reliably take on an M4 Sherman. This vehicle was followed by the Ho-Ni II which was armed with a Type 91 105mm Howitzer. This, in turn, was followed by the Ho-Ni III which was armed with the Type 3 75mm Gun, the same gun as the Ci-Nu. The tank force was primarily under the command of the IJA, and not the navy. Also, due to the nature of the Pacific theater, were operations mostly involved small islands ill-suited for tanks, these were deployed only in several large scale operational areas, were they could be effective in blitzkrieg-style tactics. These include China, the Philippines, Burma, Indonesia (Java), while some were dispersed in support of infantry units on Okinawa, Iwo Jima and several other islands. On December 22, near Damortis, on Luzon island (Philippines) the first clash between Japanese and US tanks occurred. They were opposed to M3 and M2A4 light tanks of the American 192nd Tank Battalion. The 57 mm (2.24 in) gun of the Chi-Ha, then the best frontline IJA tank, proved useless against their armor. In Burma, engaging second and third rate light tanks, and a few Stuarts from the 2nd Royal Tank Regiment, the Japanese proved deadly. By 1943, the SNLF, or Navy Armored Force, received its first amphibious tanks, like the Ka-Mi. 223 units would be built until 1945. The Germans sent two Panzer IIIs to Japan, followed later by plans of their more advanced tanks. However, upgrades were slow to appear and the development of really effective German-style tanks never really materialized. Only a few of these new types were completed by 1945, and many prototypes never entered production. Lacking materials and petrol, Japan’s industrial capacities were hampered to the point of complete inefficiency. This famous photo of a Type 94 Te-Ke on the back of an M4 Shermans highlights the desparity between US and Japanese vehicles during WW2. The last tanks built were allocated to home defense units, waiting for the invasion (operation Olympic), which never came. When the Soviets invaded Manchuria in August 1945, they found an impressive tank force, at least on the paper, but a deep ravine separated the IJA and Soviet types. The latter had constantly improved their models in response to German tanks, and were much more advanced in speed, firepower and protection than the average IJA models, which were light and/or obsolete by any standards of the time. It has to be said that the Japanese never had the capacity to develop large-scale production, at least comparable to the western powers. Even during the war, the US naval blockade, mostly performed by the US Navy Air Force and submarines, began to be felt in 1943. By late 1944, Japan was deprived of all kinds of industrial resources, previously taken from south-east Asia, and their industries were constantly hammered by swarms of B-29 bombers operating from China, and later from Iwo Jima and Okinawa. Production efforts were split between the needs of the Army and Navy, leading to many specifications and many proposed vehicles, almost all never surpassing the prototype or pre-series stages. Dear Sirs,Just found your website and it’s great.I am interested in Japanese armor,especially prototypes and oddballs that never made it into production. Can anyone suggest what was the basis for Tintin Blue Lotus tank or carrier vehicle? I am trying to do a display panel for an eventual exhibit about Herge and his characters Tintin, Milou [Snowy, in English] and the others. Any suggestion is greatly appreciated. Kind regards! Philippe, from Lethbridge, Alberta, Canada. Not guest writers, but we are always in search of new members to contribute to the site. Would you be interested? Good day gentlemen. I would just like to say THANK YOU for creating such a fantastic web site dedicated to all these wonderful tanks. I came here looking for a bit of info and was astounded but the wealth of it there was. The link does not work for the Type 3 Ka-Chi in Amphibious tanks (223 units). It does now. This is not automatic in this area, the page needs a links update. There is a small section concerning this vehicle on the Chi-Nu article. Dear sirs: you photo above identified as a Type 5 To-Ku, is not correct. Look at the chassis for one. It is too small and short; it is a Type 95 chassis. The prototype Type 5 To-Ku chassis was based on the Type 5 Chi-Ri medium tank chassis/hull and would have 8 road wheels, as your fine drawing shows on the article page for this tank. BTW – I see Wikipedia has been used as a source for many of your IJA tank articles; I have spent the last year and a half updating and editing many of the articles therein with RS sources, so you may want to check your information used, which was based on said Wikipedia articles. I do enjoy your site, keep up the good work. Cheers, Kierzek. Our older articles are in a state of upgrade at present. We will be updated said article ASAP. Excellent. One other note, the photo identified as a Type 3 Ka-Chi above, is really a Type 2 Ka-Mi; again, Type 95 chassis. As you know, the Type 3 Ka-Chi was based on a modified Type 1 Chi-He chassis with 2 extra road wheels and two extra return rollers on each side. Very wonderful website mentlegens! However, I must point out your O-I article is outdated, the O-I was 150 tons, not 120. The O-I was developed as a mobile bunker on the fields of Manchuria, so the 150 ton weight wouldn’t have been much of a problem. BTW,there is some inaccurate data on the O-I in your article, the vehicle was intended to be 150 tons in weight, not 120. The “O-Ho” you list as the 140-150 ton variant is a Wargaming creation based on inaccurate information on the O-I. Furthermore, in-game, the O-Ho is listed as a 120 ton tank. Any sources for those claims? The idea of the O-I being 150 tons was supported by documents found in 2015. These are analyzed by Japanese tank historian Eon-Ae-Sun on her blog. She works as historical consultant for Japanese Ground Forces in War Thunder and is generally considered today to be one of the foremost historians on the subject today. * O-Ho is based on the drawings from the book “Imperial Japanese Army Ground Weapon Guide 1872-1945”. Unlike the drawings of “O-I 100t”, which is what the tier 7 Japanese heavy tank O-Ni is based on, the dawings of the “O-I 120t” has basically no basis on them; they are *purely* based on false information and rumors. Due to this, the O-I 120t/O-Ho never actually existed. In-game name is incorrect. The name “O-Ho” means “fifth (super) heavy tank”. There however are no third and fourth super-heavy designs, as the O-I was the first and the Type 4/5 (O-Ro/O-Ro Kai) second design. If the O-Ho actually existed, a more realistic designation would be “O-I III” (as the both O-I 100t (O-Ni) and O-I 120t are based on designs that were earlier designs than the O-Ro, they most likely would have been referred as “altnerate” designs to the O-I – O-I 100t and O-I 120t as O-I II and O-I III, respectively). We are aware of Eon Ae Sun’s work, which we have covered and analyzed. We feel that our current article best represents the currently available information. If more comes to light, we will look at it and reevaluate our work. Also, it should be noted that Eon Ae Sun is an amateur historian, just like ourselves, not a professional. Also, there are some credibility issues raised about her work, not least of which is the fact she doesn’t mention her sources. As for WoT, we’ll steer well clear of that when looking for historical sources, not least of which due to the Japanese heavy line which is a mess of wrongly interpreted data and outright fake vehicles. Really Awesome and very informative site. 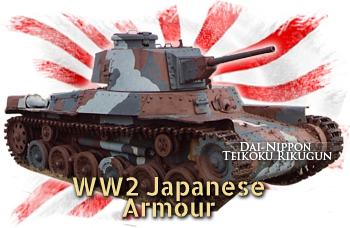 I am very interested in Japanese WWII Armor and vehicles and coming across your website has been most refreshing. Great work and after reading the comments section it is wonderful to have so many other like minded members adding even more info. Do you guys have a plan for the Type 5 Ho-Ri tank destroyer? I’ve always been interested by Japanese tanks and the Ho-Ri is a vehicle I know little about. That section of the article was removed in order pending a rewrite. Your Type 95 Heavy tank pic shows in fact a Type 91 Heavy Tank, easily identifiable by the large number of roadwheels and the main turret shape.